One of the largest game birds, the wild turkey is found only in North America but its domesticated cousins are familiar around the world. So popular for hunting that it was once close to extinction, careful management has wild turkey populations thriving today and has even expanded the bird's range beyond its historical boundaries. The wild turkey is a distinct and instantly recognizable bird, and even non-birders can easily identify these familiar fowl. Knowing the key field marks for the species, however, can help birders learn more about wild turkeys and how to identify them properly. Markings: Males have a bare head and the neck is covered with thick red wattles. The body is overall grayish-black with an iridescent gleam in good light, with white barring on the primary feathers. The distinctive tail fan is dark brown and black barred with buff terminal bands on each tail feather, and males have a long tuft of dark breast feathers. Females are smaller with less iridescent coloring, a smaller tail and smaller neck wattles. Females also typically lack the breast “beard” feathers, though short beards are present on some older hens. For both genders, legs and feet are pale and eyes are dark. Depending on the bird's mood and emotions, the head can change color from pale white or pink to brighter red or light blue. Juvenile birds are similar to adults but with less refined markings and overall smaller size. Wild turkeys eat a wide variety of foods, including insects, frogs, lizards, fruit, grain, seeds and nuts. These omnivorous birds may scratch through debris on the ground to uncover food as well as pluck food directly off different plants. Wild turkeys are fairly common throughout the continental United States and central Mexico but are rare in the high Rocky Mountains and desert areas as well as extreme northern Minnesota, North Dakota and Montana. Overall, these birds are more common in the eastern parts of their range. Turkeys prefer open woodland and rural habitats with nut-bearing trees and shrubs. Wild turkeys do not migrate, but may be nomadic, particularly in winter, depending on local food availability. The most distinctive call of the wild turkey is the fast “gobble-gobble-gobble” males use during the spring breeding season. Other calls by both males and females include “cluck” and “yelp” sounds to indicate movement or nest warnings. Wild turkeys are gregarious birds and live in medium to large flocks with one dominant male “tom” and up to 20 or more female “hens.” The birds have superb hearing and eyesight and are powerful fliers. They forage almost continuously on the ground but roost in trees at night. During the breeding season, males strut and display their broad tail feathers for courtship rituals and use similar behavior throughout the year to show dominance or aggression, especially when multiple males are nearby. Male wild turkeys are polygamous and will mate with several hens in the same year. Hens incubate one brood of 8-18 eggs per year in a ground nest in tall grass or under concealing shrubs or bushes for approximately 27 days. The eggs are a creamy white or buff color, and may be splotched with brown or red dots at one end. After hatching, females lead the fledgling birds to food and the young birds quickly learn to forage for themselves. Among young birds, females are called jennies and males are called jakes. Wild turkeys are large game birds with little to fear from most predators. They will be attracted to rural areas with oak trees and scrub brush that can provide secure ground cover. 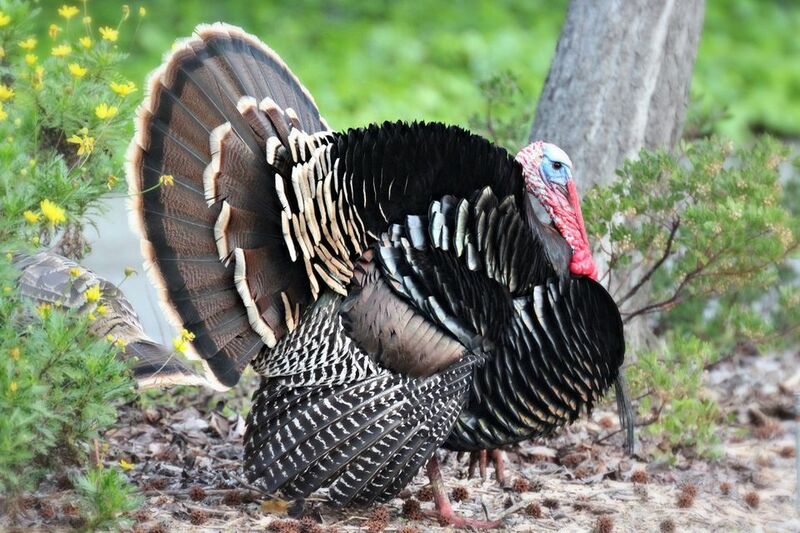 Birders can offer cracked corn and other grain as supplemental food and may be able to attract nearby wild turkeys with artificial turkey calls. Backyard birders should note, however, that wild turkeys can be aggressive and have big appetites, and they are not always welcome in populated areas. Some states also have laws against feeding wild turkeys because such actions can complicate regulated hunting seasons. Wild turkeys are not considered threatened or endangered, and regulated hunting seasons have helped ensure stable populations in many areas. In some communities, wild turkeys are considered a nuisance because large flocks can develop and the birds may damage property as they forage. In these situations, authorities may seek to relocate or cull the birds as needed. In their wild habitats, preserving suitable food sources and roosting sites is essential to help wild turkeys thrive.